Attorney General Lynch Signs Off 41P Final Ruling. It WILL Happen in as little as 180 days. Included in the president’s inappropriately named “New Executive Actions to Reduce Gun Violence and Make Our Communities Safer” is the official harbinger of the BATFE’s 41P rule change. Despite NFA owners being among the most law abiding gun owners who already have to jump through the most hoops, and despite the fact that – on average – NFA firearms are pretty much never used in crimes, the president’s edicts makes it more difficult to purchase what he calls “some of the most dangerous weapons and other items” through a trust, corporation, or other legal entity. This change will require fingerprints, photographs, and background checks for all “responsible persons” of the trust or other legal entity. It is unclear what this change will do to the ability for legal entities to use the eForms system, which the BATFE claims to have been spending considerable time and resources on improving and getting the broken eForms Form 1 functionality working again, as the system appears to have no mechanism for accepting photographs or fingerprint or information. Read the full final ruling. The Introduction to the Unified Agenda of Federal Regulatory and Deregulatory Actions was published today in the Federal Register, and it contained what may be a telling excerpt regarding BATFE’s proposed rule 41P. The Unified Agenda is essentially the roadmap for regulatory planning throughout the coming year. According to the publication’s summary, the document is meant to “identify regulatory priorities and provide additional detail about the most important significant regulatory actions that agencies expect to take in the coming year.” Obviously, one agency in particular is of special interest around here: The Bureau of Alcohol, Tobacco, Firearms, and Explosives – or BATFE. ATF issues regulations to enforce the Federal laws relating to the manufacture and commerce of firearms and explosives. ATF’s mission and regulations are designed to, among other objectives, curb illegal traffic in, and criminal use of, firearms and explosives, and to assist State, local, and other Federal law enforcement agencies in reducing crime and violence. The Department is planning to finalize a proposed rule to amend ATF’s regulations regarding the making or transferring of a firearm under the National Firearms Act. As proposed, this rule would (1) add a definition for the term “responsible person”; (2) require each responsible person of a corporation, trust or legal entity to complete a specified form, and to submit photographs and fingerprints; and (3) modify the requirements regarding the certificate of the chief law enforcement officer. ATF will continue, as a priority during fiscal year 2016, to seek modifications to its regulations governing commerce in firearms and explosives. ATF plans to issue regulations to finalize the current interim rules implementing the provisions of the Safe Explosives Act, title XI, subtitle C, of Public Law 107-296, the Homeland Security Act of 2002 (enacted Nov. 25, 2002). ATF also has begun a rulemaking process that will lead to promulgation of a revised set of regulations (27 CFR part 771) governing the procedure and practice for proposed denial of applications for explosives licenses or permits and proposed revocation of such licenses and permits. 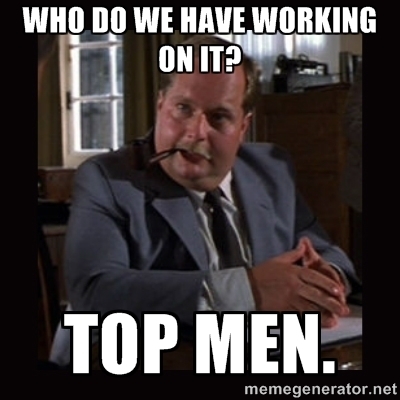 Note that this still does not mean that the BATFE is finalizing plans to implement the proposed rule. As we previously reported, BATFE received approximately 9,500 comments about the proposal, each of which must be addressed before making a decision. Resources working on 41P may have been diverted to perusing some of the 310,000 or so comments received regarding the M855 ammo ban which must, likewise, be read and responded to. It may well be that 41P is at the top of BATFE’s priority list simply to clear it from their docket, as they did with the “green tip ban,” and move on to other issues. While it may not be much of an update, and firearms owners’ only recourse may still be to just “wait and see,” at least there is some indication that something is happening somewhere, and someone may be looking into it. 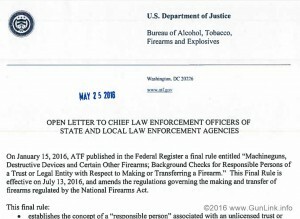 Two years to the day after the comment period – which received well over 9,000 comments – ended, there is still little news other than that the Bureau of Alcohol, Tobacco, Firearms, and Explosives (BATFE) has amended the rule 41P status to reflect yet another pushback of up to one month. The 41P status page has been again updated to reflect a mysterious final action date of 01/00/2016 from the previously noted and equally curious 12/00/2015 final action date. It should again be pointed out that this date is the date by which the BATFE will make a decision on whether or not to implement the changes set forth in the proposed rule, not necessarily the date by which the rule takes effect – if it is ever approved and takes effect at all. During the 12th Annual Import/Export Conference, I asked ATF howpending transfers would be treated, if a new rule was implemented. 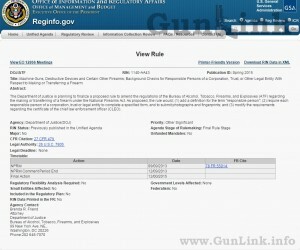 ATF responded that any new regulation would only apply to applications submitted after the effective date of the regulation. Attorney Merting confirmed that this was consistent with what Attorney Friend told him. In essence, it is more of the same wait-and-see that we have had for the last two years. As always, the GunLink Blog will post additional details as they become available. 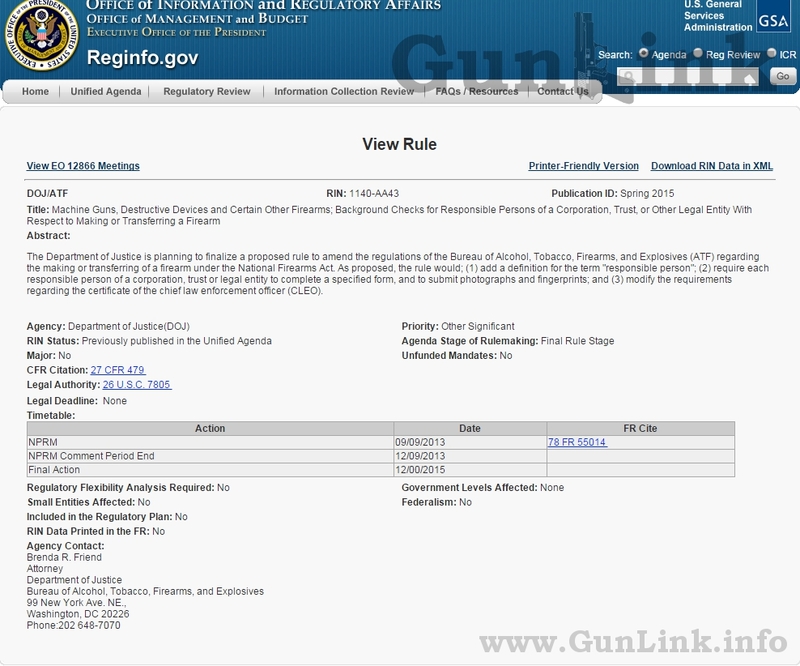 As we get closer and closer to the theoretical “12/00/2015” final action date for the ATF’s Rule 41P – the rule that would make it more difficult to make or transfer NFA items to a gun trust – there hasn’t been much chatter about it. This includes the absence of a reply to the 9,500 or so comments that were submitted during the comment period that must be responded to. Prince Law reported in August that there were four reviewers working through those comments. This year saw, once again, renewed pushes for more gun control that fell flat and served to do little other than rally support against such gun control measures. Anti-gun zealots were, once again, caught cooking the books to get false numbers that they spread as gospel and telling outright lies. This, along with mainstream media coverage of the danger of “gun free zones” this year may even be awakening some of the general public to the utter nonsense that is the gun control agenda. That turning tide of Second Amendment proponents away from being “the silent majority” is a great thing to see. Some of the delay in 41P movement is said to have been a result of the government resources that had to be devoted to reading the more than 300,000 comments on the armor piercing ammunition regulations (which were ultimately scrapped because “we spoke, they listened“). Note that this mythical zeroth day of December cited on the Rule 1140-AA43 page is not given as an effective date for 41P. It is the current “final action” date, upon which they will decide whether to scrap this ruling, as they did with the ammo ban, or go with it. Public sentiment aside, there is also the question of political sentiment. Second Amendment rights are again becoming a hot topic that is finding its way into the media’s political spotlight, to include presidential debates. Add to that the fact that there is legislation introduced that will weaken the NFA’s grip on silencers rather than tighten it, as 41P would do. HR3799 is drawing congressional support with 17 Representatives from 14 states cosponsoring the bill. In other congressional news, HR3799 co-sponsor Rep. John Carter (R-TX) proposed an amendment to the FY16 appropriations bill, HR2578, which would neuter 41P. H.Amdt 320, which prohibits funds made available by the appropriations bill from being “used to propose or to issue a rule that would change the Chief Law Enforcement Officer certificate requirement in a manner that has the same substance as the proposed rule published on September 9, 2013” was agreed to by a voice vote the day before the bill passed the House. However, H.Amdt 320 – as Sec. 548 in the 6/8/2015 version referred in Senate – appears to be struck from the 6/18 version reported with amendment to Senate. In sum, nobody still knows when anything will happen or, if and when it happens, what it will be. Nobody knows if 41P will die on the vine, be dropped altogether, or picked up and run with. Nor, if it is the latter, does anyone know how such a scheme would be implemented, what would (or would not) be grandfathered, what would happen to submitted applications in the processing queue, etc. At least, if they do know, they aren’t telling. A final decision on ruling 41P – the rule change that would add further impediments to owning NFA items such as silencers and short barreled firearms – has officially been pushed back. Again. Previously expected nearly a year ago, a decision was pushed back to the end of 2014 and then again to “sometime in May 2015.” More recently, the NSSF released a statement that a decision would likely not come for another six months at a minimum. Keep in mind that this does not mean that 41P will go into effect in December or, for that matter, that a decision will actually be reached by that point. Several dates have been given as the final action date, yet those dates have come and gone with only more delays. In addition to addressing each concern raised in the 9,500+ comments received on the matter, the NSSF brought up a number of technological and implementation hurdles that would need to be addressed – perhaps no small obstacle given the history of eForm 4 implementation, management, maintenance, and (pending) re-launch. Despite all of that, a decision will be reached at some point, whether it is in December or later. However, that decision could very well be to say that “this is all rubbish, let’s scrap the idea.” Regardless of when the decision comes and what it is, we maintain that there is no time like the present to jump into the NFA game and doing so with an NFA gun trust is an easy way to do it. Join the 41P discussion on the GunLink forums or add your comments below.